NYT columnist Anand Giridharadas may want to get some sensitivity training on how not to overreact about something as petty as his hairdo, which rises about 10 feet off his forehead. That is not a crack on his ethnicity, which is Indian. It’s a crack on his personality, which is thin-skinned. 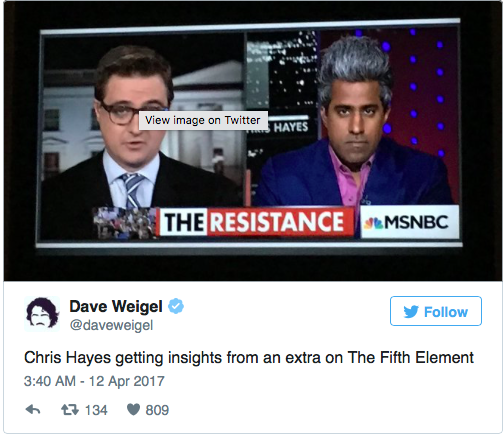 The Mirror first became aware of Anand’s spectacular do in April of 2016 when he appeared on MSNBC’s “Morning Joe” alongside Joe Scarborough, who has a similar, but far less impressive coif. I wondered whether he was trying to show up the “Morning Joe” host with his towering locks. I awarded him one of The Mirror‘s highest honors: TV Hair of the Day. Scarborough is not the white “Morning Joe” host, mind you. He’s just the host, who happens to be Caucasian. Griswold detailed the Twitter fight between the two men. The Fifth Element is a science fiction film, which Anand took to be a racist attack. So he fought with Weigel on Twitter and tattled on him to WaPo Executive Editor Marty Baron. According to online reports, Anand lived in Mumbai between 2003 and 2009, but grew up in Shaker Heights, Ohio, Paris and Maryland. In 2011, he wrote a book, India Calling: An Intimate Portrait of a Nation’s Remaking. In 2014, he wrote another: The True American: Murder and Mercy in Texas. Weigel told The Mirror that the men have buried the hatchet. Wouldn’t want a race war to spark over an innocent hair observation. Let’s hope Anand can either a) Get his coiffe chopped or b) deal with the fact that his luscious locks attract attention when he goes on TV and stop being such a race-baiting baby.